Ordering, delivery and other basics. We invest directly in winemakers. We don't invest in sales, marketing, fancy packaging and other things you can't taste. Which means you get more bang for your buck. People that help us invest get an even better deal. We call them Angels. What can NakedWines.com do for me? and be filled with a warm, fuzzy feeling as you bask in the gratitude of the winemakers you're helping. If you become an Angel, you earn these benefits by investing $40 a month in your Naked piggy bank, yours to spend on any of our wines whenever you want. But the Angels are a closed group at this time. If you'd like to become an Angel, you can put your name on the waiting list. Look around a bit, pick from our highest rated wines or grab a mixed 6-pack we've put together for new customers, and check out! Or if you're a techno-phobe, give us a ring at 1-800-673-4718 and we'll place the order for you. We can ship packs of 6 and cases of 12 virtually anywhere. Some states can also take larger packs (with 15 bottles in them). Your best bet is to click on the basket button in the top right corner of the page where it will tell you how many more bottles you need to add to checkout. For mainland United States orders that are less than $100, we ship for $9.99 via FedEx, GSO or UPS. Delivery is included with each purchase of $100 or more except for NJ, HI and AK where there is no delivery included. New Jersey shipping is a flat $19.99, while Alaska and Hawaii cost $130 and $70 per package respectively. Depending on your address, deliveries are on Monday-Friday or Tuesday-Saturday during regular working hours and they'll require a signature from somebody over 21 years old. Most deliveries will generally take 2-6 business days. You should get an order confirmation email when you place your order, and a separate tracking email when we get your tracking info from the carrier. If you live very close to a warehouse, you may not receive the tracking email until after the first delivery attempt. The shipper will attempt to deliver three times and then they turn into a pumpkin. Ok, not really. But almost. And we're as frustrated as you are when deliveries don't go smoothly. Some states will actually destroy your parcel if nobody's there to receive it 3 times in a row and wasting wine makes everybody angry. If you're having delivery issues, the best way to sort it out is to call in at 1-800-673-4718 and we can figure out the best way to get you your wine. We love shipping to business addresses. Deliveries to commercial addresses are M-F during normal business hours. Since our orders require an adult signature, work places tend to be a great way of guaranteeing delivery. We can ship to: AK, AZ, CA, CO, CT, DC, FL, GA, HI, IA, ID, IL, IN, KS, LA, MA, MD, ME, MI, MN, MO, MT, NE, NV, NH, NY, NJ, NM, NC, ND, OK, OR, PA, SC, SD, TN, TX, VT, VA, WA, WI, WV, WY. We cannot ship to PO Boxes, APO, AFT, DPO or FPO addresses. For some zanier addresses (eg. I live in a van down by the river!) we'll only accept them with a telephone number. Yes, and we have a number of convenient shipping options depending on where you're having the wine delivered. Important: Please remember that somebody needs to be there to sign for the wine and they need to be 21+ years old. In some states we can't work with FedEx. We're always working on ways to make your shipping more convenient. We work with several reliable carriers and distribution partners, depending on where you live. We have multiple warehouses that specialize in getting the wine to you as quickly as possible so you'll receive a timely delivery from a dependable carrier. Yes, but make sure the person is 21 and that they'll sign to receive it. We can also include gift messages. And a big shiny sticker on top of the parcel so they know a friend got it for them. During checkout, we'll verify that we can legally ship the wine to the address you're sending it to. If there are any problems, we'll let you know before we charge you. If you want to cancel your order for any reason give us a ring at 1-800-673-4718 as soon as possible and we'll cancel it for you and give you your money back. What if I don't like a wine? You get your money back. We only charge you for the wine you love, guaranteed. And let us know by going to your Naked Me and giving the wine a thumbs down. Once you do that, we know to steer you away from wines that taste similar and you can avoid other wines you might not enjoy. And we'll also use this to figure out which winemakers are doing the best job at making wines our customers will love. It's a win-win! Still not sure what to go for? Give us a ring at 1-800-673-4718 and ask for one of our friendly Wine Advisors who will customize a case to match YOUR taste buds. Who are the Angels mentioned all over this site? Angels found a smarter way to buy wine. Angels get this by depositing $40 a month into their Naked piggy bank to spend on wine whenever they like. And because we're confident that you'll use the money in your account to buy these delicious wines, we don't have to invest in sales, marketing and other stuff you can't taste. Then you get to use your money to get these amazing handcrafted wines, and you get them at Angel-only prices 40-60% off because they wouldn't even exist without your support. So how do I become an Angel? Canceling your Angel status is easy. There are 14753 people waiting in line to get their wings so we'll give your spot to one of them. You can cancel at any time in the Angels Account tab of the My Account section of the website or just click here. Or call us at 1-800-673-4718. Either way, we'll cancel your account and refund any unspent contributions you have made. If you're into wine, you probably know that "wine club" usually means you pay a subscription and the club (often a winery) sends regular shipments of wine. We aren't doing that. Instead, Angels put money in their piggy bank (not a subscription; they can get it back at any time). And they can come and shop at the site with that money as often or as little as they want. Most of our customers like this way better since they choose what wine they get and when they get it. But in the more general sense, we are a group of people who really enjoy wine. So if "wine club" just meant a club that likes wine, we'd be that. Being an Angel means you're financing new winemakers and creating new projects (often folks who couldn't afford to have a winery without your support), and you tend to get much more bang for your buck because of that. 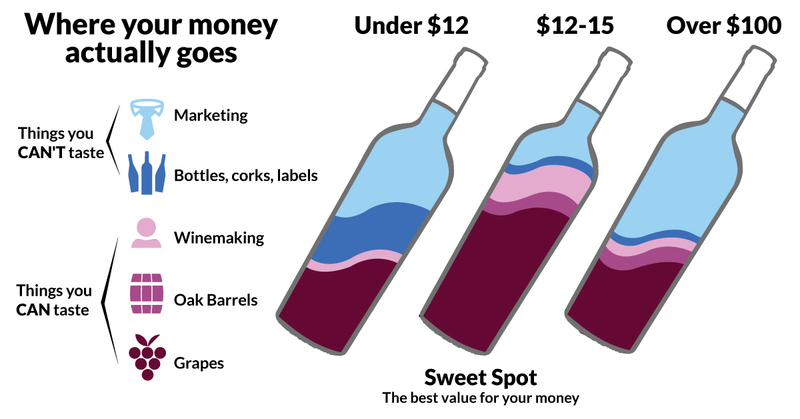 "The cost of selling wine direct to consumer is huge. You either have expensive real estate that attracts visitors or you're spending a big budget to reach out and get people to come to you. Then you're hiring staff (because a winemaker should be in the cellar, not pouring wine all day for looky-loos), training sales people, and giving healthy commissions to folks who sign up club members." "Even if Angels pay less money per bottle than other people who visit a winery and buy direct, the winemaker is often making more per bottle. No sales team, no marketing campaigns, no fancy French architects designing multi-million dollar tourist attractions on Highway 29." Is this a flash sale site? No, Angels save money all the time, not just for short slash sales with limited windows of opportunity. It's more than temporary discounts on wine. Angels actually make production less risky and less costly. Flash sales are by definition temporary. On the other hand, the value Angels create last year after year. The way Angels crowd-fund wines means that the winemaker never wastes money on sales or marketing. So quality can go up and prices come down vintage after vintage. The UK version of the website does have timed sales offers, but it's a pretty tiny part of what we do. Can I find these wines at a store? Probably not. Virtually all the wines on the site are Angel-funded and exclusively available here. But our winemakers are all responsible for some of the famous wines you will find at stores. Angels crowd-fund these winemakers and promise to drink up all their wine, so the winemakers offer the wines exclusively through NakedWines.com and many are reserved for the Angels. What do the percentage ratings mean next to each wine? We ask customers a simple question: "Would you buy this wine again?" We look specifically at customers who have already ordered a bottle of this vintage of the wine, and calculate the percentage of people who say they would buy the wine again. If you hover your mouse cursor over the rating, you'll often see how past vintages were rated as well. Note: if you try a wine as part of a curated case, we don’t count that rating toward this score - we use that rating internally to improve our case offerings, and your feedback will still be shared with the winemaker who has a chance to chat with you directly! How do I know which wines are the most popular? Millions of customers have reviewed and rated the wines on the site. There's a big rating next to each wine that shows the percentage of customers who ordered a bottle from that vintage and said they'd like to buy it again. An improvement we made in March 2018 was to only include ratings from customers who chose to buy the wine, excluding customers who bought the wine as part of a mystery case or curated case. While we don’t count that rating toward this score - we use that rating internally to improve our case offerings, and your feedback will still be shared with the winemaker who has a chance to chat with you directly! What's with this Angel Bottle? Do you really give bottles to Angels? Yep, we do! It's an exclusive reward for our Angel customers who are key members of the community and deserve every drop of those bottles. The wine is delicious. We intentionally pick our best wines because we want to make the reward as good as possible and we want to get good feedback from our beloved Angels. Haha, yes, these are 750 ml bottles of delicious wine. We love how skeptical people are about this special treat. This really is a frequently asked question, and we're happy to say this is a real offer. One FULL-SIZED bottle of awesome wine included in your case each month that you order. How do I get the bottle? If you're an Angel, the bottle will appear in your Naked Me and you can add it to your basket from there. Just add 11 other bottles to your basket and checkout and you should have a $0 bottle in that order. If you have trouble, don't hesitate to email chat@nakedwines.com or give us a ring at 1-800-673-4718. I added a case to my basket. Why won't it let me check out? Unfortunately, some areas (like TN, NE and DC) won't let you order more than 12 bottles at a time. If you add a 12 bottle case to your basket that's 12+1 and it won't work. :( See the full list of irritating state laws that might be getting between you and your wine here. If you have trouble picking out the wines and getting the order to work, just send us an email at chat@nakedwines.com or call 1-800-673-4718. When does the Angel bottle appear in my cart? When the bottle appears varies month-to-month based on inventory availability, but if you get impatient you can always email chat@nakedwines.com or give us a ring at 1-800-673-4718. Keep an eye on your Naked Me page and your inbox to be sure you don't miss out. What do I do if I can't find my Angel bottle? Sometimes, the Angel bottle may be deleted from your basket. If you're entitled to an Angel bottle, you can find it again by visiting your Naked Me. You have a wall on your Naked Me page and you will see a post there with an 'add to basket' option for the Angel sample bottle. If you need any further assistance, give us a ring at 1-800-673-4718. I became an Angel last month but I didn't get a Angel bottle! You may have gotten your wings after we sent out the Angel sample. Email chat@nakedwines.com or give us a ring at 1-800-673-4718 and we'll sort it all out. You can find mixed cases under the cases tab or assemble your own case through the wines tab. You can also browse individual wines to build your own case. Sort those wines by the highest customer ratings, or filter them to only see red wines, white wines, or sweet wines. Once you've tried a few wines, you should tell us whether you think you'd buy them again or not. This will let us customize the entire store to your tastebuds. If you keep telling us you dislike oaky Chardonnay, we can stop showing you oaky Chard. If you say you love a big inky Zin you tried, we'll show you other Zins or maybe a Petite Sirah. The more often you give feedback, the better we can customize the shop. If you want to cancel your order for any reason give us a ring on 1-800-673-4718 as soon as possible and we'll cancel it for you and give you your money back. N.B. Because we deliver very promptly and many states have specific laws about the transfer and shipment of wine, it isn't always possible to cancel the delivery. That warehouse team moves as fast as lightning! But you can refuse to accept the wines when they arrive (just tell the delivery person to return the wines to sender). We'll refund your money when the wine arrives back at the warehouse. Reeefuuund! If you don't like a wine, or it's corked or damaged, then we'll give you a full refund. Email us at chat@nakedwines.com or call us at 1-800-673-4718 and we'll sort it out for you. How do I talk to winemakers and other customers? We rely on feedback from customers so we can grow and improveso please don't be shy! Say whether you liked your wine. Get to know other Naked customers and the team by joining one of the Naked Chat Groups, OR create your own discussion group! You can also 'buddy' up with other customers so you can share reviews etc. To do this, click on their name and you'll be given the option to 'follow' them. Every time they write a post, you'll then get an email alert to hear what they've got to say. TOP TIP: The BEST place to start is to join our Naked Novices group and introduce yourself! Can I make wine for you? How do you pick winemakers? You can read more about our winemakers' illustrious careers at some of the world's best wineries and see that we really get the cream of the crop! Why do winemakers work with Angel funding? How can I work with NakedWines.com? Just drop us an email at suppliers@nakedwines.com. We're looking for talented winemakers who have sussed out great opportunities to make wine and need help with the financing and sales. So tell us what you've done that makes you special, what opportunities you've found, and give us an idea of how we can help you. What is the MarketPlace thing I heard about? In the UK, we allow winemakers to pitch their wines directly to consumers through a part of the site called MarketPlace. Feel free to check that out and see how it works. We plan on bringing this to the US one day too. What the heck is this voucher I received? We'll also try to make the choice easy for you by recommending a case of wine. The recommended case has a good panoply of wines that represent the diversity and quality of our range. That said, if you want to build your own case, feel free to do that under the Wines tab of our website. Note that the voucher you got should say exactly how much money you get off and it will probably have a minimum spend on there too. Like $50 off of a purchase of at least $200. If you build your own case, make sure that you hit the minimum spend amount or you won't be able to claim the voucher. For vouchers with delivery included, this does not apply for shipments to AK or HI. You can order 6 or 12 bottles. Check out our pre-mixed case recommendations. Use the filters on our wines page to look at all red wines, all white wines, or all sweet wines. If you're still not sure what to go for, just give us a ring at 1-800-673-4718 and speak with our Customer Happiness Team who will help you make a case that fits your taste buds. How should I store/serve my wine? Download our free app (for Angels). Everything you need to know about the wines in your order is on there, including the occasional video from a winemaker telling you about how they made the wine, why the wine is so tasty and what makes the wine special. How long should I wait before opening the wine? It really depends on the individual delivery. Sometimes the wine is fine the day of, but it usually pays to have a bit of patience. They have come a loooooooooonnng way and will look and taste better after a little nap. Old reds especially. If you can't wait to dive in, try something light and white. The best thing to do is find somewhere consistent. Avoid big swings in temperature, humidity, and light. If the bottle has a cork, try to lay it down so the cork stays a bit wet. And try to find somewhere dark, but that's less crucial. There's nothing wrong with keeping bottles in the fridge (dark, stable temperature, stable humidity) but you'll want to take the wine out before drinking it to get to the right temperature (especially on reds and richer wines and higher alcohol wines). If you could have a dream storage, there are lots of articles online about perfect storage conditions. You want a cellar that is pretty humid, cool (like 65 F), and dark. The cellar temperature slowly fluctuates over the year which is great as long as the fluctuation is sloooow (like as slow as the seasons change). And you want to lay the bottle down so it keeps the cork closure wet, but you ideally also want a bit of the air bubble in the bottle to touch the cork (so a sudden change in temperature/air pressure will push air through the cork rather than wine). So you know, if you ever decide to turn your neighbor's flat into a wine cellar, now you know exactly what you're aiming for. What temperature should I serve my wines at? Reds should be closer to 65 degrees F. Some people say room temperature but that's dead wrong if you live in Florida and think room temperature is a balmy 80 degrees. Think room temperature in a nice restaurant where it's actually a bit chilly. What should I serve with the wine? The general rule here is food you like with wine you like and people you like sharing your wine with. There are a handful of combinations where that won't work but this rule works 98% of the time. Some things kill wine so avoid: toothpaste enchiladas, chewing gum toffees, coca-cola souffle, artichokes in all forms and anything else that's really sweet or bitter. Drink Italian wine with Italian food and French wine with rich French dishes - they've had thousands of years to get it right. Serve wines in order of increasing weight - if you serve a big red before dinner, nobody will taste a thing afterward. Start gentle and go up from there. The exception to this if you really need to clean a palate is to go with a very crisp, refreshing wine like a sparkling white or an Albarino. The acidity (think citric acid, not battery acid) will cut clean through whatever you eating / drinking and refresh your palate. Go ahead and serve red with meat and white with chicken / fish / salads. As you learn more about wine, you can get more daring and you'll learn that this rule is actually pretty limiting. But if you're just starting, the basics are perfectly fine. What's with all the twist off caps? Many, many of our wines use twist off caps. These spoil wine much less than cork closures do. For wines that are meant to be consumed young (and most of our Angels do consume wine within a year of purchasing them) screw cap preserves the freshness and style that the winemaker wanted to present to you. Mainstream middlemen in the US are scared of switching to screwcap because most wine drinkers haven't been exposed to it yet. They often force winemakers to use cork even though screwcap might be superior for a particular wine. Entire countries like Australia and New Zealand have switched to screwcap and think it's ridiculous that that they are forced to bottle their wines with corks just for the American market. How long will these wines age? Whites are generally ready to consume as soon as they're on the site, and the fresh, crisp whites should be consumed within a year. The richer, oakier whites or the very structured, mineral whites (if you don't know what that means, don't feel bad. Neither do I.) can generally age more than a few years. You can generally hold the reds for at least 2 years and often much more. There should be aging recommendations on the individual wine pages - if that's missing feel free to ask the winemaker and we'll get it updated. But a good basic rule is that if we put a cork in it, you can hold onto it for a bit longer as its expected to age and we've traded off the consistency of screwcap for the aging potential of cork. All this assumes you have a good place to store the wine. If the place you keep your wine regularly swings in temperature or under bright lights, you should probably not try to age the wine for decades. But let's face it, you're going to drink 99% of this wine within a month of buying it. So dive in!